All she wants is enough peace and quiet to complete her multi-lingual series of children's books. Where better to find it than in an old cottage on the rural estate of her dear friends, the Ashendens of Ballynagh, Ireland? But as she settles in, translator Torrey Tunet finds trouble in paradise. First she witnesses her best friend Rowena Keegan's murderous attack on her beloved grandfather, Dr. Ashenden. Then Torrey lies to the police to protect Rowena. When Dr. Ashenden is found dead in the forest, Inspector O'Hare has all but convicted Rowena, and indicted Torrey as collaborator. What is Rowena hiding? 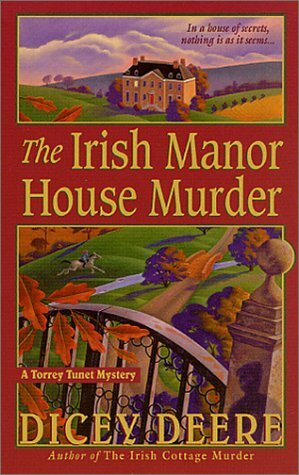 It's up to Torrey to discover a wellspring of evil in a bucolic Irish village where the reign of terror has only just begun...AUTHORBIO: DICEY DEERE, the author of one previous Torrey Tunet mystery, The Irish Cottage Murder, lives in an 18th-century Whaler's cottage in Sag Harbor, New York. In May or October, she can usually be found at a bed-and-breakfast in Ireland. This was a good one and I would like to read more by this author. This book is now on its way to goofbunny who won FeistyPom2Love's March Book, Tea and Chocolate sweepstakes. It may take about two months to arrive as I sent it by surface mail. Enjoy! Hi loveamystery, thank you kindly for your package. I received it on 2 August 2010, so I guess it took longer than expected to get here! I'm so sorry it's taken me a month to journal this book. I will pass it on as soon as I can!